As you can imagine, with over 80 years in the business, we’ve seen just about everything when it comes to kitchen remodeling. That’s why we dusted off the old blog and started posting again. We want to save people from making kitchen remodeling mistakes. Obviously, making one – or even all – of these mistakes won’t ruin your life. Luckily, life is more resilient than that! 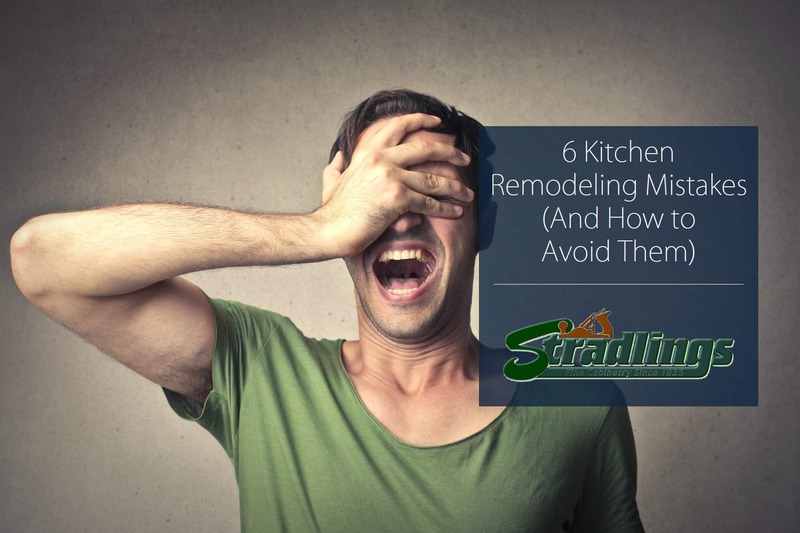 But, these remodeling no-no’s will make your kitchen harder to navigate and less “friendly” to the people using it (like you). Plus, some of them waste a lot of money, and we don’t know anybody who likes to do that. Keep reading to save yourself from those head-slapping, What was I thinking?! moments. When it comes time to sell your home, remodeling your kitchen offers a decent return on investment. You recoup around two-thirds of the cost of a major remodel and around 80 percent of a minor one. However, the items that don’t add a lot of value, ironically, are those with the biggest price tag: gourmet appliances. We’ve said it before – unless you’re a gourmet cook, you really don’t need that six burner, professional-grade stove. Of course, if it’s an item you’ve always dreamed of having, go ahead and splurge. Just don’t expect to recoup the cost of those luxury appliances when you sell your home. We can’t tell you how many people who design their own kitchen forget to include a trash receptacle. 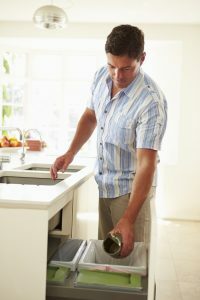 It’s one of the most common things we see, which is odd since a remodel is the perfect time to create a convenient yet hidden space for your trash. Of course, every home generates garbage, but nobody likes to see the evidence. That’s why popular options include slide-out under-the-sink models, cabinets that hide a tilt-out trash can, and a hole cut into the countertop. 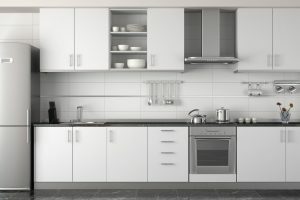 When redesigning your kitchen, it can be tempting to fall under the bigger is better spell, or fill the room with every kitchen gadget you’ve ever wanted. Resist temptation. You want people to be able walk around the dishwasher when it’s open (preferably because they’re loading it). A well-designed kitchen layout includes room for all of your doors and appliances to open freely, not to mention space for the people using the kitchen. It’s not only a matter of comfort, it’s about safety. The National Kitchen and Bath Association offers very detailed guidelines to help you maximize both functionality and safety. It starts with how wide the entryway should be (minimum of 32″) and goes on to describe the ideal distance between work areas, clearance for seating, cooking surface ventilation, and much more. Matte, or flat, paints have risen in popularity in recent years, thanks to their velvety appearance. And, while we agree that they look great, they aren’t a great choice for your kitchen. Why? They just don’t hold up to cleaning. And if there are any walls in your home that will need the occasional wipe down, they’re in your kitchen. Flat paints begin breaking down the first time you try to clean up a splatter, to say nothing of the occasional bump with a wet mop. For a paint job that lasts, use high-gloss or semi-gloss paints instead. They’re durable and we recommend them for any walls that need regular cleaning. If you love dusting, fill your kitchen with open shelves. Otherwise, save this trendy look for the cabinets where you store frequently used items, those gorgeous gourmet pots, or your novelty coffee cup collection. Also, concentrate your open cabinets above the counter, not below it. Lower shelves are much more likely to attract dust, not to mention the occasional misstep or bump. An experienced design team helps you avoid all of these kitchen remodeling mistakes. Your designer works with you to develop the perfect layout, choose the best products and materials for the job, and helps keep the entire project – and your subcontractors – on schedule. They can even tell you how to stretch your remodeling budget. Stradling’s design pros love what they do. If you’re ready to learn more, schedule your free consultation today.